One week ago, Dov Hikind launched his “Antisemite of the Year Award” voting, featuring a top ten of rabid anti-Semites and receiving thousands of votes. It was close race that pinned the classic hater, Louis Farrakhan, against his relative newcomer acolyte, Linda Sarsour. But out of nowhere, as the polls were closing, Omar unleashed an antisemitic tirade on Twitter, and suddenly jumped to the top of the voting list. 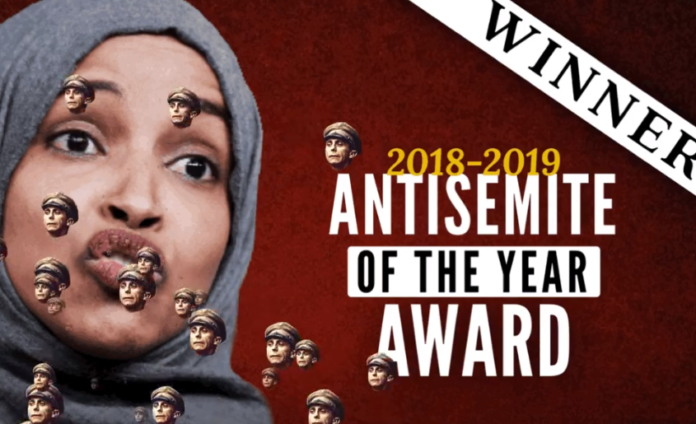 As the winner of the anti-Semite of the Year Award, Hikind will be sending a signed copy of Hitler’s Mein Kampf so that she can have more inspiration. ‘Twas a tight race but as a thoroughbred Antisemite, @ilhan surpassed all others tnx to her Goebbels-style remarks. I am looking forward for her acceptance speech. meanwhile Ilhan Omar praises Dem activist Calling AIPAC ‘Central Pillar of the Occupation’ after apologizing for anti-Semitic tweets. Dov Hikind does a great disservice to the memory of holocaust victims and cheapens the atrocities of the Nazi’s by comparing Omar’s tweets to Goebbels propoganda. Hikind is turning the legitimate fight against antisemitism into a partisan battering ram. He ignores the antisemitism of the right and engages in hyperbole with regard to the antisemitism of the left. Why send her that disgusting book? That just legitimises the book and gives credence and attention to her vile statements. Why not send her a Holocaust diary or a VIP invitation to the Holocaust museum in Washington? The way to tackle hate is not with hate and PR stunts. We have to reach out and try to build bridges. To show her how mistaken and foolish she is in a professional and courteous manner. We dont need to stoop down to a Twitter war with her to defend ourselves. But the year just began? What’s the rush Dov?